Dr. Harris graduated from Palmer College in 1989. Prior to studying at Chiropractic School, he attended Austin Peay State University receiving his Bachelors of Science in Heath and Physical Education . 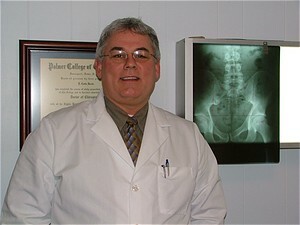 Dr. Harris received post doctorate training at Logan Chiropractic College as a Certified Chiropractic Sports Physician. He is also certified in Graston Technique. He is trained in several techniques to include: Gonstead, Thompson, Activator, Graston, and Diverseified. Dr Harris has been practicing for over 20 years. He has been very busy over the past several years being involved in the treatment of athletes at all levels. He was the Director of Chiropractic services for the International Police and Fire Games in 2000. He served as the Medical Director for the Indianapolis-Scarbourgh Canada Peace Games for several years. Dr. Harris was a providing chiropractor at the 2006 and 2007 National Track and Field Championships and the 2008 Olympic Trials in Eugene, Orgeon. Dr. Harris has also been involved in providing care in Professional Rodeo. Dr.Harris has served as a team doctors for a local high school. Dr. Harris has also had extensive training in treatment of auto crash injuries and insurance peer review. He has also kept up to date on many continuing educational classes, ensuring that his patients receive the most comprehensive and advanced chiropractic care.